Raffia ribbon crocheted over cord gives this eye-catching container sturdy construction and a great finish. 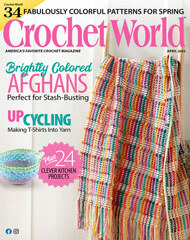 This e-pattern was originally published in the November 2010 issue of Crochet! magazine. Size: 9" diameter. Made with matte raffia ribbon, 6mm macrame cord and size H (5mm) hook.